I’ve been cooking for friends again on my return to the states and slowly creeping back to mostly Vegan cooking. Most recently I made some Tempeh Chili Con Frijoles for some friends. It was good but because there was a lack of good guacamole/avacados (how I miss going to the market and buying some ripe for today (leo) and some ones for later (kesho) from our official avacado supplier in Kisumu) I though that sour cream might be a nice topping. 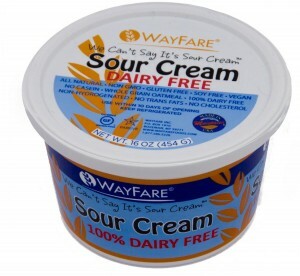 I made the mistake of buying some “We Can’t Say It’s Sour Cream“, as that was the only vegan sour cream available from Whole Paycheck. Its one of those products that gives vegan food a bad name, its got an odd gritty complexion more akin to grits than cream and the taste is definitely sour but closer to off-yoghurt than sour cream. Everyone thought it was one of the most unpleasant things that had been in their mouths for a while. The mere fact its called “We can’t call it sour cream” really seems like a cruel joke, as well, you can’t call it sour cream as its pretty unpleasant in texture and flavour. Seems so strange when Tofuti make a pretty decent sour cream so its not as if this is a revolutionary product. And apparently I’m not alone in this, which is also odd and the sheer fact I now have a giant tub of something I can’t stand to eat just makes me sad and a little angry. I hate wasting food but unless there was a huge donation to Kulisha on the line, theres no way anymore of this is going inside of me. So please don’t judge vegan food from this, or from the smell of Chicagos finest vegan cheese (which is definitely better than it smells but not as good as Sheese). There are definitely better options out there. 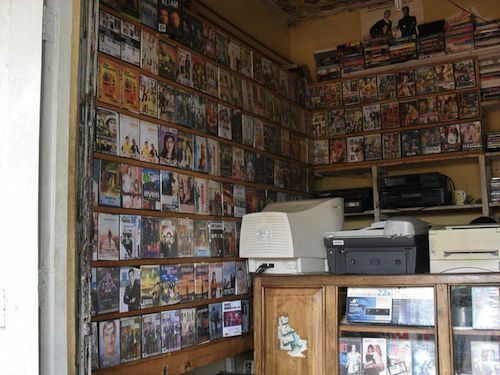 In Kenya you generally only see bootleg DVDs for sale (the only original DVDs I’ve seen have been in very-large supermarkets and typically are religions or self-help style DVDs). Many of the knockoff DVDs are camcorder copies of blockbuster movies from Russian and Eastern European Cinemas, often with hilarious bored audiences and fighting couples. Because your should only buy original pirate movies , obviously. I wonder what they mean? Any suggestions? Maybe ‘Kinitial’ should be the peak of excitement when loading a new Kinetic game, before 5mins of gameplay crushes any chance you’ll ever play the game again. Strangely the two best new places we’ve found to eat in Kisumu recently have both been in petrol stations along the Kisumu/Nairobi Road. Hemali (South Indian Food) – Libya Oil Petrol Station, Kisumu/Nairobi Road. Hemali has probably been here a long time but we only just noticed their sign the other day. They have lots of western and Kenya staples, but the reason to go their is for their Southern Indian Food. Its cheap, spicey and tastey. We had some great Bhel Puri, Potato Chat and an ok dosai. We were stuffed and very happy. Restaurant has a lot of privacy from the Petrol Station, though with plastic chairs and tables and functional air to it. Has some great Sugar Cane Juice with some nice spice in it. Cheap and delicious with many many vegetarian options. If it was nearer to town it would give Raj Sappy a run for its money as the best cheap lunch spot. 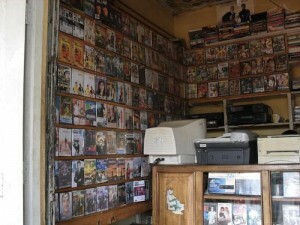 Turtle Bar (Mexican Food) – Triton Petrol Station, Kisumu/Nairobi Road. This is a strange place as it forms one edge of the petrol station and the windows all look towards the petrol pumps. It has an outside eating area right on the forecourt, a real problem with mosquitos, a lime green interior, one small tv for football and banging DJ music even on a quiet sunday evening. However, it does have pretty passable tex-mex food, which was a huge surprise. Better than Mariposa in its prime, as everything was pretty tasty (unlike Mariposa’s guacamole at the end, which was just mashed Avocados without salt, lime or anything else). Their beer prices are a little ridiculous considering you’re drinking in a Petrol Station right on the Nairobi/Kisumu road. Service was was strangely aggressive and the prices in the menu are not what we were charged and it took a while to remedy. But even with all negatives, the food is worth the trip (for Kisumu) esp if your jonesing for some Mexican Food esp as there are lots of vegetarian options. Average life expectancy in Nyanza is approximately 40 years for men and women, according to the Institue of Social Development. This is almost ten years less than the national average. Kenya has over 1.1 million children that don’t attend any school (even though primary school education is supposed to be free), ranking it 7th in the world behind Nigeria, Pakistan, India, Ethiopia, Bangladesh and Niger. (Standard, 30th September 2011). A currency that has lost 23% of its value this year, from around 81Ksh to the dollar in January, to 104 Ksh to the dollar on wednesday the 28th September . An official inflation rate of over 17% for August. Food Inflation rate of almost 24% this month. And so people are really struggling just to get by. And then when you want to escape a little, the International Criminal Court Preliminary hearings into post-election violence in 2008 are on TV, all afternoon and evening, recounting the horrific destruction of life & property. 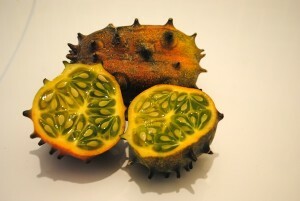 Horned Melons are now in season in Kenya. They’re a pretty curious fruit with a pleasant cucumber, lime taste and a lot of seeds. I’m still not 100% sure when they’re at their ripest but I’m really enjoying them. I’m really impressed how much time is devoted to the ICC pre-trial hearings. At least three of the main television channels are showing the ICC stream live for over 8hours a day and people really seem to be watching. There were even conflicts between people who wanted to watch the ICC and those that wanted to watch the World Athletic Championships. Its a shame that just as it gets interesting, they often make the session confidential and thus unavailable to viewers. The Harambee Stars dug deep and have hauled themselves into contention to qualify for the African Cup. They just need to beat the Ugandan Cranes by a few goals when they meet and they will have finally turned the corner (having slumped from a FIFA ranking of 68th in 1998, to 133rd today). The match against Guinea Bissau definitely wasn’t pretty, fans invaded the pitch briefly when Bissau equalised but the Stars managed to run out winners. Suzanna Owiyo and her band stayed in our compound! I have to confess that I recognized her more because of her hair, as she appears in a cleaning product commercial currently on Kenyan TV. She seemed very nice.